a world from which it's never quite immune. a disembodied hand, in blood, beside your polished shoes. has diamonds sparkling in the mid-day sun. Conor Kelly was born in Dublin (1952) and spent his adult life teaching in a school in the Dublin suburbs. He retired to a small village in the Charente region of France to play boules, sample the local cuisine and run his twitter site, @poemtoday, dedicated to the short poem. He has had poems printed in US (Southern Review, Huffington Post) British (Envoi, Snakeskin, AndOtherPoems) and Irish (Poetry Ireland Review, Honest Ulsterman) magazines. 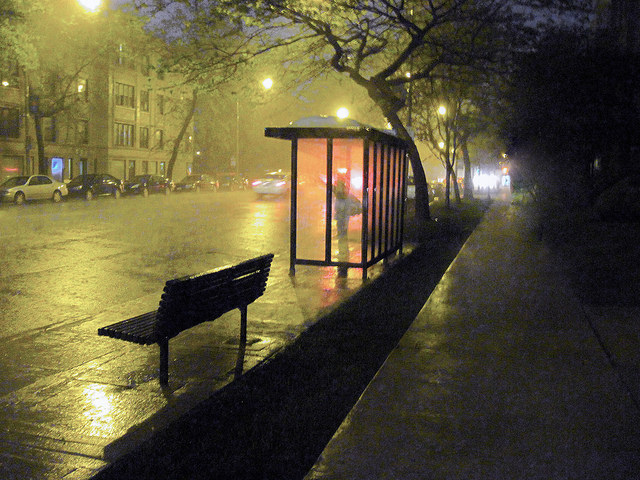 Image: "Waiting at Bus Stop" by Renee McGurk.